Apple’s new iPhone will easily meet its sales goals, with nearly 1 in 10 interested in buying the new phone. If Apple can cut the price, demand for the phone could double. Meeting sales goals shouldn’t be a problem. The survey shows that this will be relatively easy. Nearly one-in-ten respondents (9%) say they are likely to buy the new multi-function iPhone — a combination cell phone, iPod and Internet browser — when the product becomes available (3% Very Likely; 6% Somewhat Likely). Another 7% say they are likely to buy it for someone else. 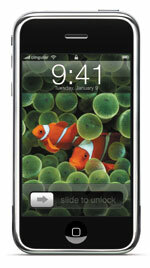 Four-in-five planning to buy the iPhone say it will likely replace their existing cell phone. The survey also asked respondents who aren’t considering buying the iPhone why they weren’t interested. More than half (55%) said they have no need, but the key finding is that 28% cited the issue of price. A follow-up question revealed that if and when the cost of the iPhone were to come down from its proposed $500-$600 range to the $200-$300 range, there would be a double-digit surge in demand for the product. “The worldwide market for total cell phones is somewhere around 1 billion and our objective of getting 1% of it would yield 10 million units across the calendar year,” CFO Tim Cook said in a recent call. The survey’s findings provide strong evidence that 10 million units are very attainable for Apple in 2008 — if the iPhone performs to consumer expectations. The impact on cellular service providers going forward could also be great. A total of 15% of respondents say they’re likely to switch service providers in the next six months. When this group was asked who they plan to switch to, Cingular (T) — Apple’s exclusive service provider partner for the U.S. — surged 8-pts to its best visibility showing ever among planned switchers in a ChangeWave survey. Verizon (VZ), however, dropped 3-pts to its lowest reading in 18 months. Other major providers experienced declines as well. A similar ripple effect is seen among cell phone manufacturers. The survey asked respondents who plan to buy a new cell phone in the next six months, which manufacturer they are likely to purchase it from. While Apple was cited by 6% of respondents, Motorola’s (MOT) share of planned buyers fell a whopping 9-pts. While it’s too early to project how much of Motorola’s decline in planned purchases is directly attributable to the upcoming debut of the iPhone, it is clear from these results that the iPhone is a potential monster that Motorola and the rest of the cellular manufacturers are now going to have to reckon with.